So, you got all your holiday shopping done, and, "Uh-oh!" Forgot someone? Well, don't panic. No need to brave last-minute crowds. You can concoct a tasty treat right in your own kitchen, and it will be gratefully received and eagerly devoured. This is not the old standby fruit cake at which everyone scoffs, or the slightly-trite cranberry bread. This is not purchased pre-gift-wrapped chocolates in a box--it's a whole new thing that I'll bet almost no one on your gift list has gotten before. Besides, in a tough economy, home-made gifts are truly from the heart, and much more appreciated. There are very few ingredients, and only one part is a bit "fussy," but it mainly involves a 'constant stirring' on the stove bit. I've included a video of the entire process, so you can see how really easy it is. True, it is a bit time-consuming, but only in stages. The actual cooking part is quick. You can do something else while waiting for the gumdrops to set up, and that takes a good 3 hours or so. Longer won't hurt them. The whole family can get involved in making these treats. While it is best if a single person is doing the cooking part, and this should be an adult, or an older teen, the fun comes at the end when they are being readied for packing. This is candy, and it does involve a lot of sugar, which is why I only make them as holiday treats...and I give most of it away..to lessen the temptation on my end! This is one of those recipes that takes longer to explain than it does to do, so please don't be scared off by the apparent lengthy directions. It sounds complicated and intimidating, but really, it's easy. I was only "scared" the first time I tried it...after that, I practically had it memorized, and regularly made at least four flavors for gifts each year. Each batch yields about 1 pound of candy. This recipe cannot be cut in half! 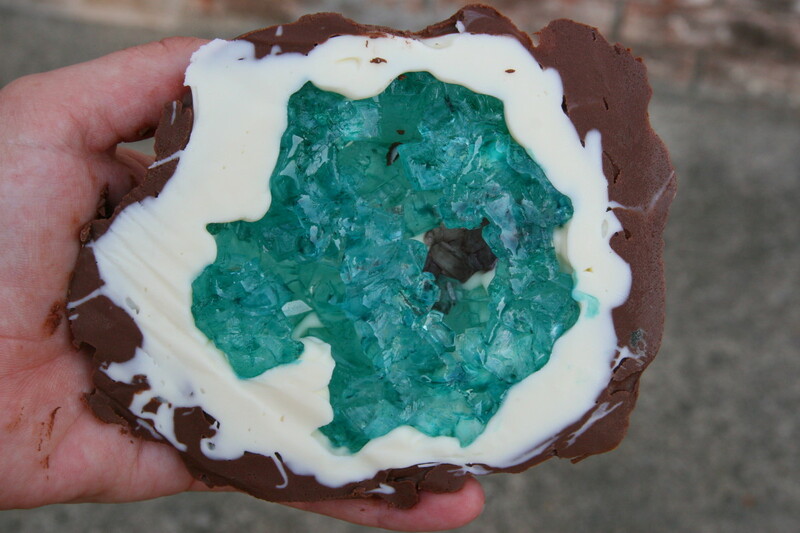 I tried it once: you get brick-hard candy, instead of soft gumdrops. This process is continuous, and once begun, cannot be stopped or interrupted, until after the candy is poured into the pan. So be sure you have set aside a time when you know you won't be interrupted by family members. If the phone rings, let the voice mail pick it up. I'm serious: you cannot stop once you begin! Therefore, have everything ready ahead of time; your ingredients and flavors pre-measured and your chosen color handy before you start. 1 package (1-3/4 oz) POWDERED fruit pectin, be sure to get the right weight package--it WILL make a difference! Combine the fruit pectin, water and baking soda in a saucepan. This mixture WILL foam, so be sure to use a large enough pan to allow for this expansion. 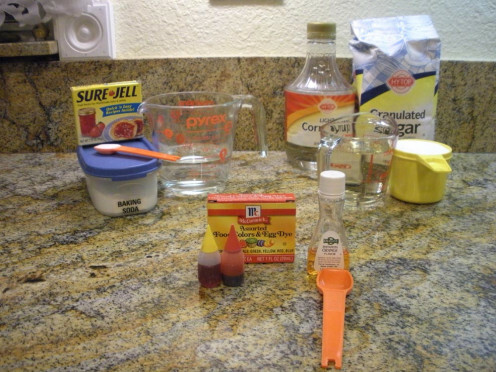 Combine the first measure of sugar and the corn syrup in a second saucepan. 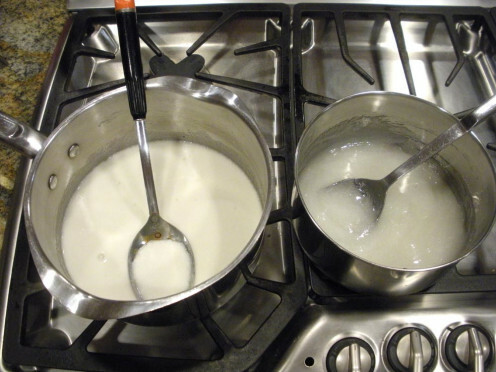 Put both pans over high heat, and stir each alternately USING SEPARATE SPOONS, until the foam disappears from the pectin mixture, and the sugar mixture boils rapidly, and the sugar is fully dissolved. 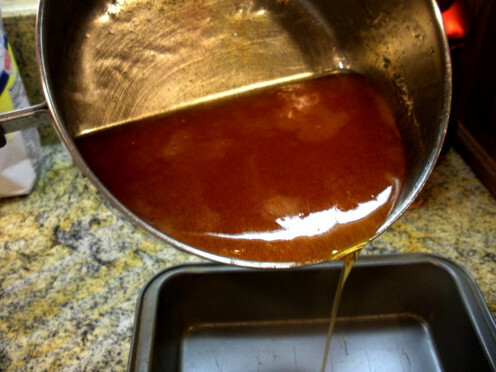 Turn off the heat under the pectin mixture, and pour it slowly, in a thin stream, into the sugar and corn syrup mixture, stirring constantly. Cook stirring constantly, about one more minute. Allow to sit at room temperature for several hours--at least 3. Do NOT refrigerate!!! 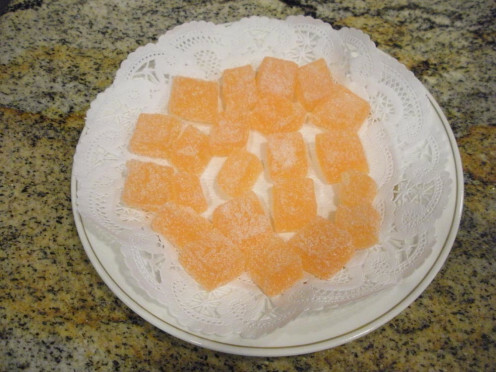 Using a sharp metal knife dipped in hot water, cut candies into squares or diamonds about 1/2" in size, and roll in the reserved sugar. 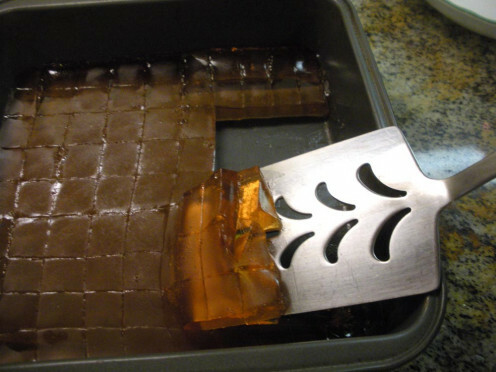 A metal turner, also dipped in hot water, can be slid underneath the cut candy to help release it from the pan. Of course, everyone is free to make up their own combinations, but the 'color/flavor' table below shows what I use. **Beware: If using clove extract, use only a couple of drops, rather than the 2 teaspoons called for with the other flavors. Clove is a very concentrated flavor, and too much will not be pleasant. 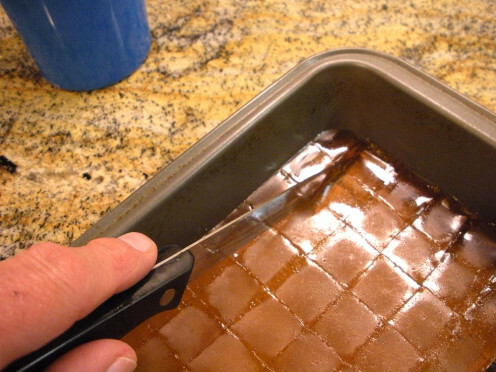 Once firmly set, cut candy into small squares; you'll need to keep re-dipping the knife in the hot water. You might want to experiment with the Licorice (Anise) flavor to see if you can get black. I imagine you'd start with purple, then add some green to muddy and darken it a bit. You might get "almost black." I've never tried it, though...it's something that just occurred to me. Finally, here's the part the kids will really enjoy helping with. 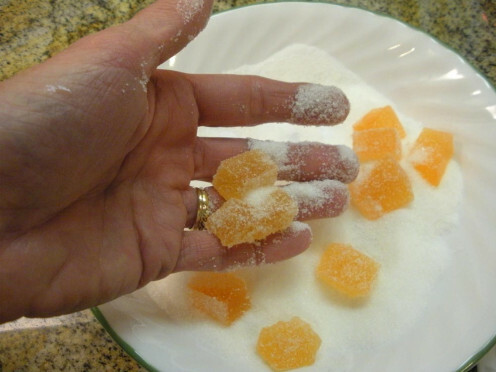 Take each cut gumdrop, and roll it well in the bowl of sugar, coating all sides, and set them into your chosen container. If you are making several layers, be sure to separate each layer from the others with waxed paper, or they will all glue themselves back together in a sticky mass. Prep and cook times above do not include the 3 hours setting time, or the cutting and sugaring time once set. Allow about a half hour for cutting and sugaring; longer if kids are involved. These candies are very soft, melt-in-your-mouth treats. Even senior citizens with dentures can enjoy them, as they do not need chewing, and they are not "hard sticky" like caramels, so they won't stick to dental work. Even folks who, for whatever reason, may be lacking teeth at all can enjoy these candies. The size you pick would be determined by how many people are on the receiving end of your gift. A larger one for an office party or big family; a small frosting tub for a single "little old lady," for example. Any of these can be pre-decorated with cheerful paper or recycled old holiday cards. You also have the option of purchased gift containers, if your budget will allow. Applesauce and jello, eh? Interesting. As a vegetarian, though, I don't eat jello or gelatin-containing products. That's why this is a great recipe, since it just uses fruit pectin. Thank you for sharing this! I think I am going to try this recipe with my kids. I remember when I was young I used to make homemade gumdrops with my grandmother but I cannot for the life of me remember the recipe. I know she used applesauce and orange powdered jello but that is all I remember. @ Au fait--I'm delighted you enjoyed this recipe. I used it for gifts for several years when my kids were little. Thanks very much for the votes and share! @ rebeccamealey--So true--and when we make things, we control the ingredients, so there are no strange preservatives or anything you can't even pronounce! Dinner mints, eh? That sounds a bit more challenging. Thanks for stopping by; I'm pleased you liked the recipe. It's amazing what we buy that can actually be made. Your gum drops recipe reminds me of my college room mate that was a home ec major. 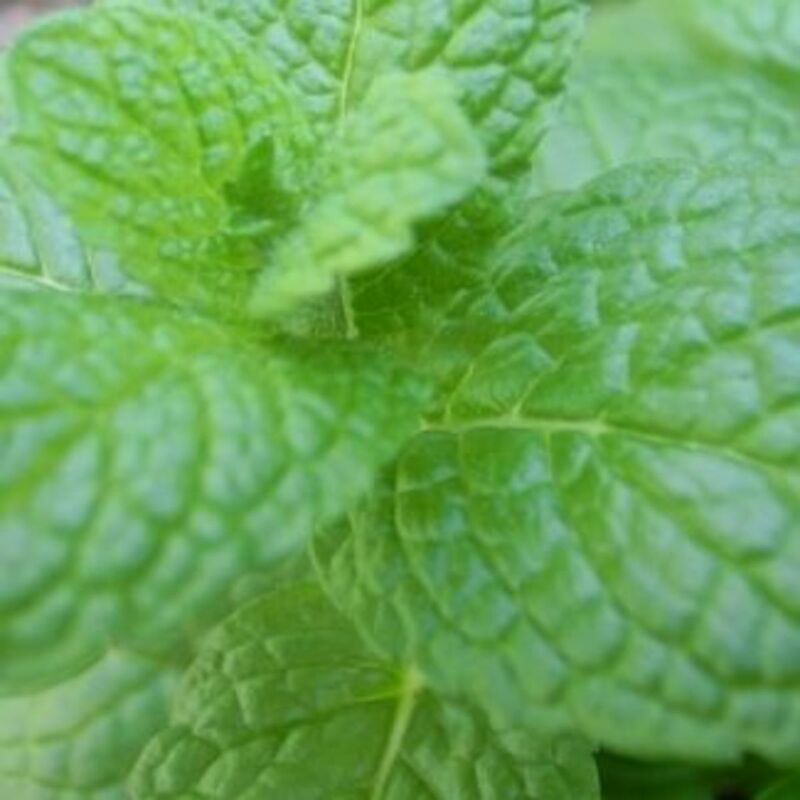 They made dinner mints. I was so impressed. This is great. Now all I need is a gummy worm recipe! What a great idea for Christmas! Sounds like the perfect thing for gift giving on a tight budget while giving a special gift from the heart, as you say. Voted up and useful and will share with my followers! Thanks very much for the votes and bookmark. 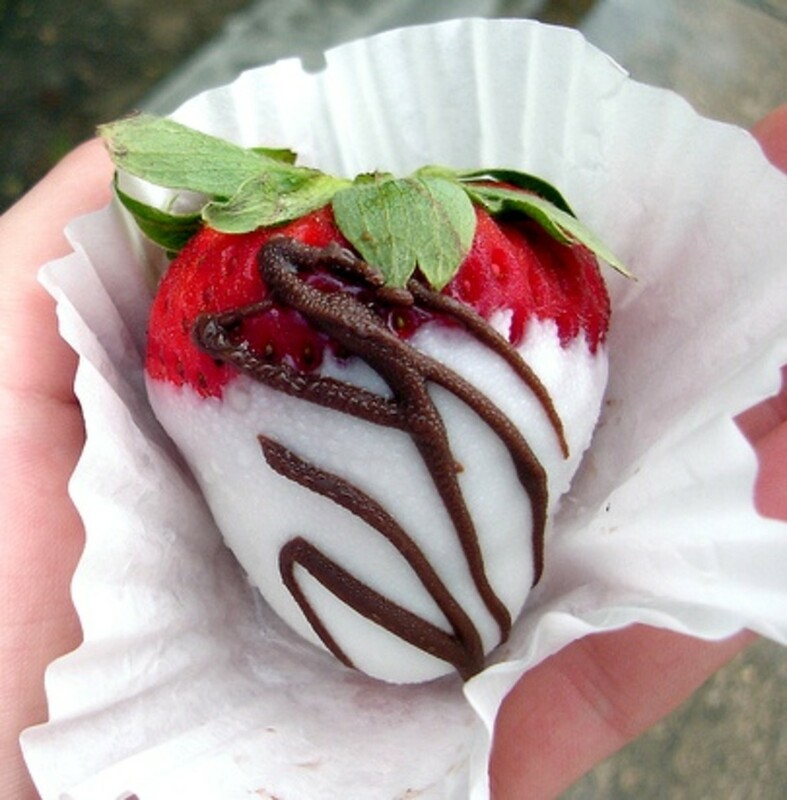 I'm very pleased you liked this, and learned how easy this treat is to make. Enjoy! I love gumdrops. Believe it or not I didn't know you could make them. Bookmarking to try later. Up, useful and interesting. Thank you so much for the compliment. Enjoy your gumdrops! 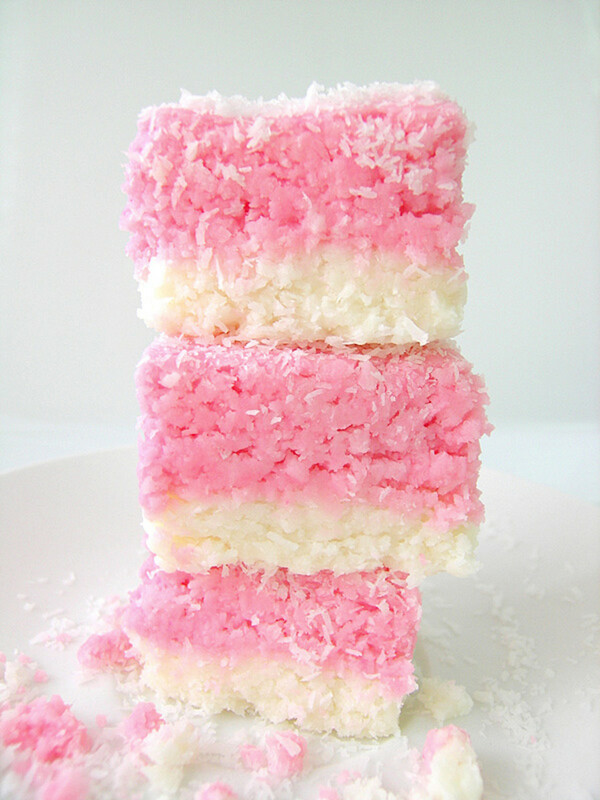 Always wanted to know how to make these. Thanks for the well written hub and easy to understand directions. Printing so I can make them. Thanks so much for your comment. Yes, they are easy, and delicious. I hope you enjoy making them. I am going to have to mark this one for a less busy time when I have time to do it right. It looks so easy. Who would have thought that gumdrops could be so easy. I bet you'd do just fine. I always bought gumdrops, and I will always buy gumdrops. I do fear I will burn them. I'm good at putting turkeys in cooking bags, though. I'm glad you liked the article and recipe. Thanks so much for stopping by. How fun and easy! Perfect for the holidays. Thanks for sharing! Thank you very much--I'm pleased you found the article of use. Thanks so much for the nice compliment! I'm glad you enjoyed the article and the video. Thanks, too, for the votes. Wow! Great hub and I had no idea that you could make such delicious sweets at home! As you say, 'messy but fun'! LOL! I think our kids would love them. You also made a great video - a star is born! Great hub + voted up awesome! Is that all there is to making gumdrops? I had no idea, but I love them.